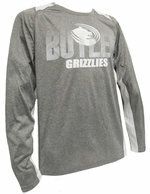 Long sleeve black Nike tee shirt with "Butler" imprinted in gray on the front left side and the Grizzly power head logo emprinted in white on the upper left front. 100% cotton. 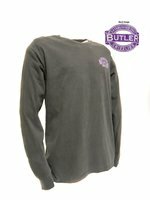 Heather gray long sleeve tagless tee shirt, "Butler" imprinted in purple and white, "Grizzlies 1927" imprinted in black on the front of the shirt. Soft & light weight. 60% cotton 40% polyester. 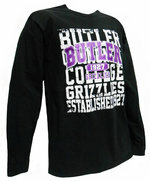 Dark gray long sleeve tagless tee shirt "Butler" imprinted in purple, black and white; "Grizzlies" imprinted in purple and the Grizzly power head imprinted in white on the front. 50% cotton 50% polyester. 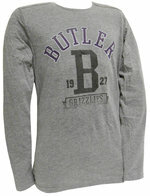 Long sleeved, dark grey t-shirt with small grahic on front left chest and full graphic on back.